I was saved October 30, 1960. A friend witnessed to me about Christ, and led me to Jesus. I prayed on the spot to accept Christ as Lord of my life. From the time I was thirteen, God had been speaking to my heart. Finally, at seventeen and a senior in high school, I could hold back no longer. I surrendered my life for full-time service. God opened the doors to preach and tell others of what He can do in their lives. On June 9, 1972, Shirley Alice Waldrop, of Forest Park, Georgia, and I were married. She is a graduate of Tift College and of the Georgia Baptist School of Nursing. We are both native Georgians. I graduated from Samford University with double major in Religion and History. From there, I continued on to New Orleans Baptist Theological Seminary for my Master’s of Divinity. I also hold my Doctorate of Ministry from Immanuel Baptist Theological Seminary. For over sixteen years, my wife and two children traveled with me. Now both our daughter and son are married. Our son Sam is a pastor in Alabama. He has a Doctorate of Ministry degree from New Orleans Baptist Theological Seminary. My wife, as a rule, normally travels with me everywhere. First and foremost, Keith is an evangelist of the Gospel of Jesus Christ. His purpose is to see the lost saved and to spur Christians to live as Christ. In preaching, Keith preaches to see the lost saved, Christians to become better disciples of Christ, and to draw those being called to full-time Christian service (missionaries, preachers, evangelists, etc). In addition, Keith teaches an End Times Conference which goes through the whole book of Revelation and explores the connection between the Old Testament prophecies and Revelation; holds witness training clinics; and teaches as an adjunct professor at Mid-Western Baptist Theological Seminary. Keith’s unique ministry includes his “Pal”, Homer. Keith and Shirley are both graduates of the Maher School of Ventriloquism, and Keith is a member of the North American Association of Ventriloquists. Keith effectively uses Homer, his dummy, to teach Bible stories and to present brief Gospel messages, especially reaching school age children and youth. Homer attracts adults and youth alike to the nightly revival services. 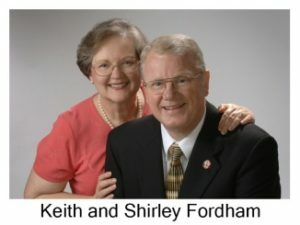 Keith’s wife, Shirley, conveys Bible lessons using her “Pal”, Joy.